The Arroll Bordeaux Single Slipper Bath is perhaps one of the most recognisable Cast Iron Baths, with it's traditional period design it exudes elegance and sophistication. The single-ended slipper bath invites you relax and soak away any stresses of the day. An excellent choice for more modest sized bathrooms. 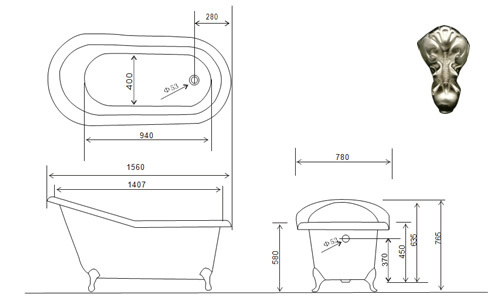 This bath comes with detailed Ball and Claw feet that can be adjusted to compensate for any floor level differences. Standard baths usually take 3 -5 working days to arrive, Painted baths usually take 7 - 14 working days to arrive, Polished baths will take 14 - 21 days to arrive.